McLaren Racing announced Saturday that it will contest the 103rd Running of the Indianapolis 500 in 2019 with Fernando Alonso at the wheel. Competing in his second Indy 500, Alonso will attempt to become only the second driver ever to secure world motorsport’s unofficial Triple Crown: victories at the Formula One Monaco Grand Prix, the 24 Hours of Le Mans endurance sports car race and the Indianapolis 500, the pinnacle race of the IndyCar Series. The feat was achieved by Graham Hill in 1972 with his win at Le Mans, following his 1966 Indy 500 victory and four triumphs in the Monaco Grand Prix. McLaren and Alonso competed at the 2017 Indianapolis 500 in a collaboration with Andretti Autosport. Alonso led for 27 laps before being forced to retire with a mechanical issue in the closing stages of the race. McLaren has won the Indy 500 three times, once in 1972 supplying Team Penske and driver Mark Donohue, and twice as a works entry, in 1974 and 1976, with driver Johnny Rutherford. In 2019, it will return as McLaren Racing. Alonso, who won the Monaco Grand Prix in 2006 and '07, as well as the 24 Hours of Le Mans this year, is just as excited to be returning to "The Greatest Spectacle in Racing." “I’ve made clear for some time my desire to achieve the Triple Crown," said Alonso, 37, the two-time F1 champion. "I had an incredible experience at Indianapolis in 2017, and I knew in my heart of hearts I had to go back if the opportunity was there. Further details on McLaren’s attempt on the Indianapolis 500 will be provided later. 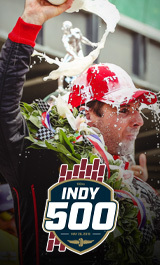 2019 tickets: Tickets for all Month of May events in 2019 at the Indianapolis Motor Speedway, including the sixth annual INDYCAR Grand Prix and the 103rd Indianapolis 500, are on sale now at IMS.com and the IMS Ticket Office.